Tonight I lost my book-throwing virginity. Sure, I've been tempted to chuck something across the room before, but have never actually done it until now.Maybe the book didn't make it all the way across the room, but it was thrust off my lap with a certain amount of ferocity. Why, you ask? Because no book should EVER have the ending that I was just subjected to. 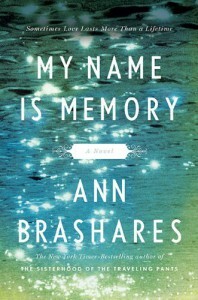 'My Name Is Memory' should have been a 5 star book. It was beautifully written, and I was captivated by the journey of one man traveling through several lifetimes, trying to right the wrongs that he had inflicted upon his one true love. With each new life Daniel was given, I followed him on the search for his "Sophia," and found myself hoping that this time would be "the time" that he would finally have her.There was a bit of back-and-forth in the timeline, as well as age differences that didn't match up (he'd be much older or younger than his love in some of the lifetimes), which vaguely reminded me of 'The Time Traveler's Wife.' However, this book transitioned much smoother and I never found myself confused like I did sometimes in TTW.I was unable to find anything wrong with this book, up until the last two pages. Rarely do I mind open endings if they're done right - leaving you with some sort of assurance that things will be resolved in the end. This book was an example of the wrong kind of open ending. Oh sure, the author tried to convey that there would be hope, but somehow failed to hit the mark. I am completely confused as to why the hero wrote a letter to his beloved that he didn't actually send because for reasons unknown, he was unable to, yet he never explained why. What...the...heck?It isn't fair that such a great book had such an unresolved ending. Had this been a first book in a series, this is what would have been called a cliffhanger, which would have been no big deal because there would have been a book 2 to look forward to. Unfortunately, this one appears to be a stand-alone, which makes me sad. *edit* As of right now, book 2 is in limbo. If a book 2 does eventually happen, I will revise my review to reflect a more positive outlook.